Science Week was all about getting hands on experience – especially for participants in Ocean Life Education’s Marine Incursion programs. 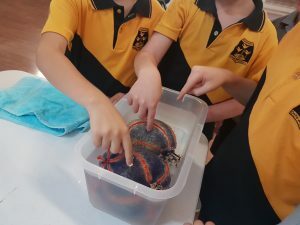 More than a thousand children got up close and personal with our colourful marine creatures during a busy week of visits to early learning centres, schools and Bunnings hardware stores in the week of August 12-20. Director of Education at Ocean Life Richard Coward says it’s the personal touch that helps to establish that lifetime bond between children and nature. And you never know, through stroking a stripy tropical sea cucumber, the seed may have been sown in some young minds to seek out a career in science as an ecologist or marine biologist. We’re already taking bookings for our marine incursion programs for next year’s Science Week – we have presentations suitable for all age groups, each one encouraging a greater respect for our natural world. If your Science Week was a bit of a fizzer this year don’t fret, because it’s never too late to inspire the next generation of conservationists – Ocean Life Education’s Marine Life Incursion programs are available to visit your centre all year round. This entry was posted in Uncategorized on August 29, 2017 by oceanlifeeducation. 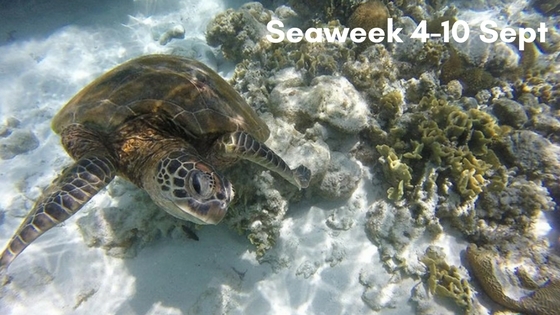 Seaweek is Australia’s major national public awareness campaign to educate and encourage an appreciation of our oceans. At Ocean Life Education, there are a few times each year where we relish in the global appreciation for the marine environment and our wondrous ocean – and Seaweek is one of them. This year’s Seaweek theme is the second of the Ocean Literacy Principles: The ocean and life in the ocean shape the features of Earth. It focuses on how the ocean shapes our Earth through sedimentary rocks, sea level changes, erosion in coastal areas. Our sand and beach areas consist of tiny animals and bits of plants, rocks and minerals. You can find out more about these fundamental concepts on the Ocean Literary Principle 2 website. At Ocean Life Education, our mission is to inspire as many young Australian’s to appreciate and care for our environment for the preservation and protection of our oceans and marine habitats. Our seas and oceans are our biggest wonder of the Earth and it’s our obligation to be curious and protective. Celebrate the Sea with us this Seaweek from 4-10 September. Book your live marine animal incursion and let’s educate and inspire our next generation of ocean defenders! Find out about our Programs or Contact Us to book your next program. This entry was posted in Marine knowledge on August 8, 2017 by oceanlifeeducation.